Because I live in a rural or residential area I need to know how best to clip their wings so they will stay on my property. Due to complaint from only one neighbor, I'm afraid this is now necessary. 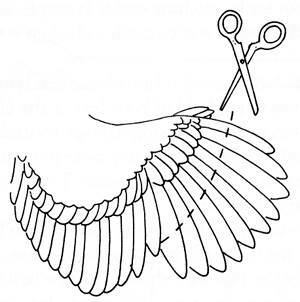 You should use a pair of sharp scissors to clip about half to 2/3 off the length of the Primary Flight feathers. These are the last 10 feathers on the chickens wing. CLIP ONLY ONE WING. This throws the bird off balance and prevents flight. If you clip both wings, the bird may still be able to fly by simply flapping harder. This is a temporary solution, because the feathers will grow back at the next molt, which may be a few months for young birds or up to one year for older ones. A potential problem is that clipping these feathers may make them harder for the bird to shed during a molt, requiring your help. The graphic below may make it a bit clearer. This is from Gail Damerow's "Guide to Raising Chickens", (used with permission from Storey Publishing). PoultryHelp.com was the incredible work of the Rocking T Ranch and Poultry Farm, which labeled itself "Your Best Source for Online Poultry Raising Information". The content on this website was created by them is and copyright of PoultryHelp.com.